If you believe what you read in some of the mainstream financial media, investing in Bitcoin is a terrible idea that guarantees you will lose most or all of your money. Instead of offering true insights on the pros and cons of Bitcoin investing, far too many financial columnists continue to recycle inaccurate myths that paint the digital currency as an extraordinarily dangerous investment. I've been researching and writing about Bitcoin for six years. Early on (in 2011), I even mined Bitcoin on my home computer. I know from personal experience that these articles are off base. In fact, the Bitcoin price is likely to rise by a factor of more than 10 over the next few years. One Bitcoin price prediction from Wedbush Securities projects the price of Bitcoin at $17,473 by 2025. And over the years, I've become acquainted with an assortment of influential members of the cryptocurrency community. I communicate regularly with such folks as Vinny Lingham, founder of Gyft and a Bitcoin Foundation board member, and Spencer Bogart, the managing director and head of research at Blockchain Capital. The opinions of these knowledgeable Bitcoin insiders often contradict what's being said in the mainstream media. And these insiders are usually proven right. The problem is that the average investor is far more likely to run across an article in Money or The Hill than the opinions of those who understand Bitcoin best. Don't get me wrong. I'm sure most of those who write for the mainstream media are well-meaning. But it's obvious they don't quite grasp the revolutionary nature of Bitcoin and why it's such a game-changing development. 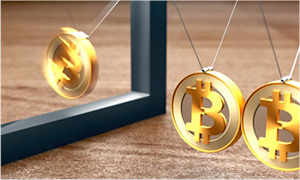 Take a recent Kiplinger article, "Should I Be Tempted to Invest in Bitcoin?" The author, Taylor Schulte, is the founder and CEO of Define Financial, a San Diego-based financial planning firm. Schulte argues against investing in Bitcoin for two reasons. First, he claims that like other commodities, Bitcoin is an investment that produces no return. This much is true, but Schulte goes awry when he says Bitcoin's future gains will depend largely on inflation, like other commodities. Then he switches gears and says that because Bitcoin is a currency, it can't increase in value as a result of inflation – "because that's exactly what inflation is – a decrease in the value of currency." My head is spinning. What Schulte and others like him don't get is that Bitcoin can't be evaluated properly as either a commodity or a currency. It functions as both. That, and its fully digital nature, makes Bitcoin a completely new animal in the world of finance. It's an odd-shaped peg that doesn't fit into any existing holes. This kind of thinking is responsible for many of the myths about investing in Bitcoin that have sprung up over the past four years. In other cases, criticisms directed against Bitcoin apply to many, if not all, other types of investments. Another well informed article david. I have a question, what are your thoughts regarding the,rising tensions between Segwit and BU? There is increasing chatter about a hard fork,could this cause a huge crash in the value of bitcoin? Thanks for reading Money Morning (and the kind words.) The division over SegWit and BU is a serious issue. I'd prefer that a consensus be reached to solve the block size problem, but I don't see either camp giving any ground. A hard fork would cause a big drop in the Bitcoin price. How much is hard to say, but a 50% drop wouldn't surprise me. If it happens, the aftermath will be what counts. Assuming both blockchains continue, a "winner" will emerge, much like we saw with Ethereum. The "winner" version of Bitcoin will then draw in more and more miners and users, while the "loser" version will exist mainly to serve its hard-core fan base. The price of both versions will eventually recover. This isn't an ideal outcome, but I believe Bitcoin must be able to cope with much higher transaction volumes to continue growing and thriving. This problem needs to be solved somehow. I suspect some sort of sidechain technology ultimately will be the answer (possibly Lightning or something like it). Very nice review. Would you please comment on the failure of the SEC to approve the Winkelvoss twins Bitcoin ETF and the two remaining Bitcoin ETF applications in at the SEC? Thanks for reading Money Morning. I'm 99.9% sure that neither of the other two Bitcoin ETFs will get approved. Here's why. The SEC's main objection to the Winklevoss ETF was that much of the global Bitcoin market is unregulated, particularly Bitcoin exchanges overseas. The SEC also wants to see "surveillance-sharing agreements" between the BATS exchange where the Winklevoss ETF planned to trade and other markets. As the SEC points out, such agreements aren't possible at this stage. The Bitcoin market simply isn't structured for it (yet). The applications of other two Bitcoin ETFs suffer from this same fatal flaw. So for the immediate future, there will be no Bitcoin ETF. At the same time, the SEC did not close the door permanently. In the decision the SEC said that should regulated Bitcoin markets of significant size develop, the agency would be willing to reconsider approving a Bitcoin ETF. There almost certainly will be a BItcoin ETF at some point, but we're looking at years, not months. The article about Bitcoin was great and very simplified where a person like me who is new to the investment world could also understand. Will you also throw some light on other cryptocurrency ETH ( Ethereum), which also in recent times have shown the uprising. Is it a next big thing after Bitcoin or it's a competitor of Bitcoin. What I have read and understood about each of them is that ,each has its own use. So I would like to know about investing in ETH. Thanks for reading Money Morning. I have written several articles on Ethereum. Here's one I did last year that explains how Ethereum works and how it differs from Bitcoin. I did another article last week explaining why the price has spiked over the past month. Ethereum can be purchased on most of the same exchanges that sell Bitcoin. But the easiest way to buy Ethereum is through Coinbase, which allows you to link directly to your bank account. Debbie, personally I feel it was good for long term the ETF was declined. Bitcoin has been gaining momentum the last 3 years all without the news of an etf. Countries are seeing the benefits of bitcoin, more companies are adopting bitcoin and blockchain technology and this has led to the price rise. We do not need the SEC grabbing hold of bitcoin in any form. It is decentralized and I pray it stays like that! I am sure the other ETFs will be turned down as well. This hard fork scenario is really dampening the price currently it seems. I am impressed Bitcoin held so strong following the etf rejection, i thought we would see sub 1000 but we are still in the 1200's but falling with the hard fork scenario looming! Thanks for reading Money Morning. While Bitcoin is a wholly digital currency, that hasn't stopped people from creating physical Bitcoin tokens. One early version, Casascius Coins were first created in 2011 and had a hologram that peeled off to reveal their private keys to the amount of Bitcoin loaded on the coin. FINCEN forced the end of the sale of Casascius Coins in the US in 2013, saying they were illegal money transmitters. Lots of other people tried making physical Bitcoins (always with the keys that represented the digital version somehow embedded), but regulatory pushback has kept them from gaining much traction. Still, if you really want to buy a physical Bitcoin they can be found on the Internet. The best place to look is eBay. Could you please share the MYTHS about ETHEREUM? Thks, for your insights and research.